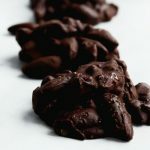 Inside Scoop: Set aside 10 minutes for these nutrient loaded dark chocolate nut clusters. Hi baru seed, our new favourite seed. Our bad, this nutty little friend isn’t actually a seed or a nut, it’s a legume. 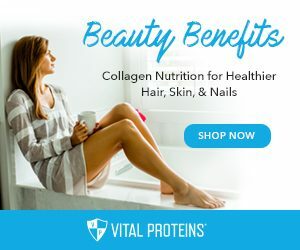 Like your trusty peanut, and to be honest it kind of tastes just like a peanut, but earthier, better looking (in our books anyway), and just a wee bit more nutrient dense. They also contain less sugar, and some other beneficial nutrients like Omega 3 fatty acids. Fav! This amazing little legume can be found in the Brazilian savannah. 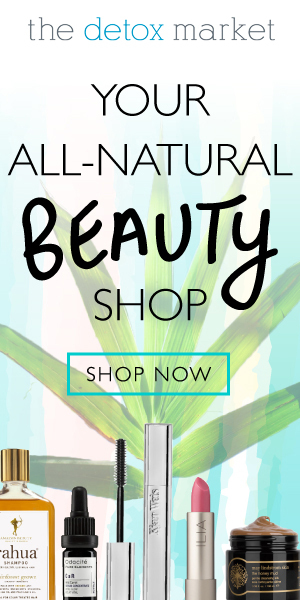 It’s hand picked, and due to the fact that baru is relatively new to North America, the local communities that harvest and sell this delicious seed are still relatively untouched, making them a much more sustainable superfood. They are loaded with protein, fiber, healthy fats, minerals, antioxidants, and are incredibly low in sugar. This super-seedy legume is the perfect on-the-go snack option that’s gluten-free, peanut-free and nut-free. We actually got our hands on Baru Baron’s baru seeds (a Toronto based baru seed company) and realized that we just have to start experimenting with this little dreamy super food. 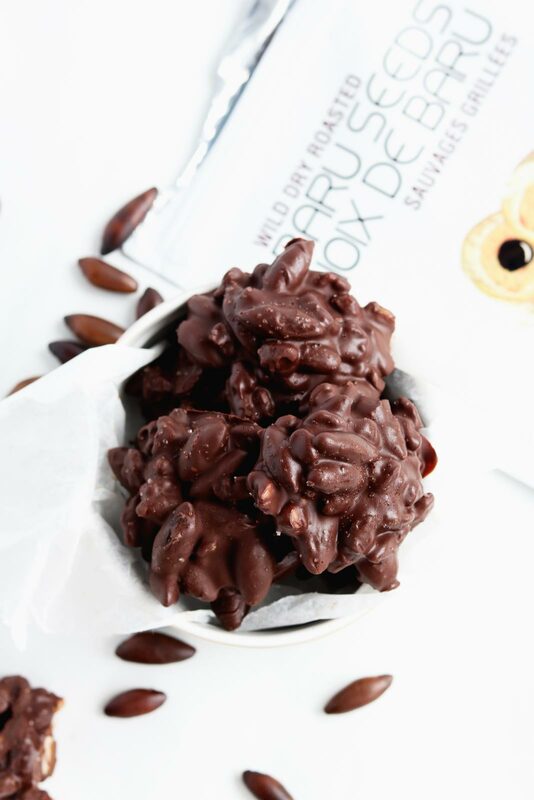 Hence these roasted dark chocolate nut clusters that contain baru, walnuts and cinnamon. Only 5 ingredients, and completely, and utterly delicious. 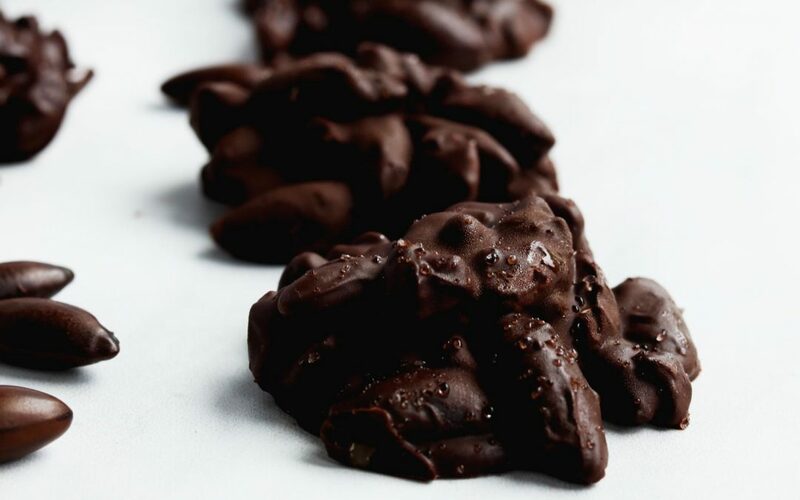 Okay, so obviously one of the most proficient ways to make nuts and seeds as enjoyable as possible is to drown them in dark chocolate and turn them into dark chocolate nut clusters, right? Yep! 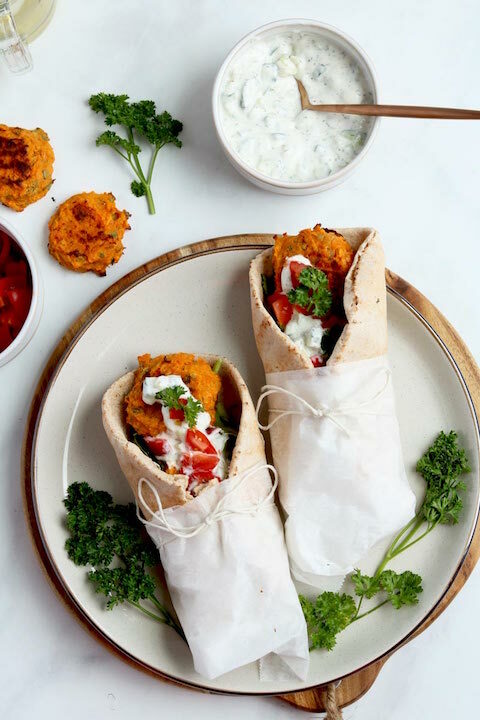 That’s exactly what we decided to do, and we were totally inspired by the N5Diet keeping this recipe in line with nutrition packed, 5 ingredients or less, styled approach. 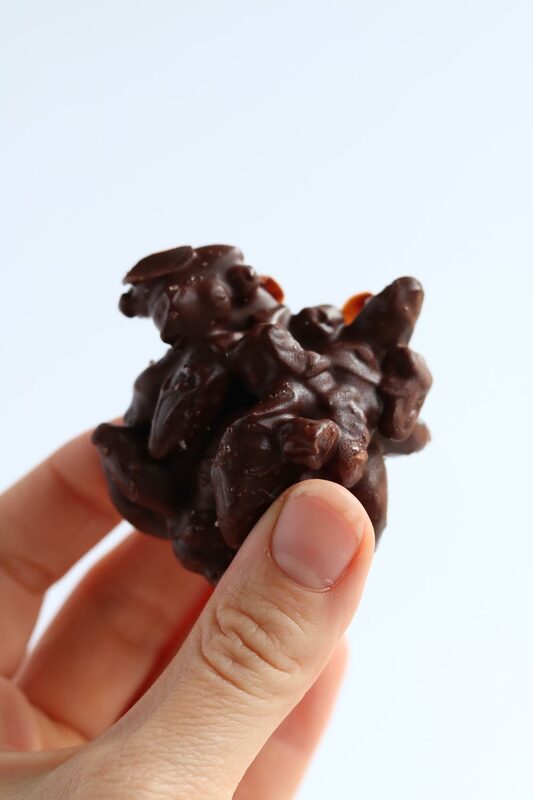 We’re also keeping these little dark chocolate nut clusters as easy peasy as possible, totally healthy, and a snack that makes your end of day chocolate session as nutrient dense as possible. Keeping it easy with 5 ingredients has been one of the biggest shifts to our cooking that we’ve made. 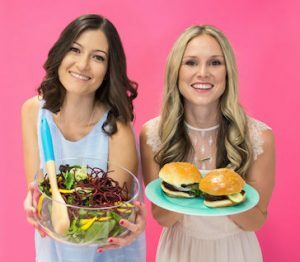 Life is busy and having meal ideas, snacks and treats on hand that take us little to no time to prep and put together has changed the way we eat. That’s why we created The N5Diet, because keeping nutrition simple has been our lifeline. 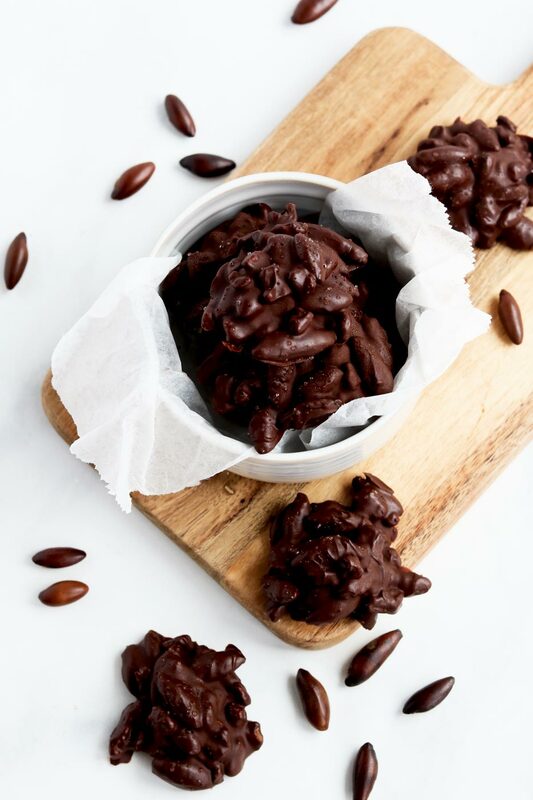 So you can expect to see a few more 5 ingredient delicious recipes, like this 5 Ingredient Chocolate Peanut Butter Fudge that can be prepped in 5 minutes, is gluten-free, vegan, made with healthy fats, protein and so chewy and delicious. Like a fudge you’d find in a fudge shop, you wouldn’t even know that it has way less sugar, and no dairy. How Can The N5Diet Fit Into Your Lifestyle? The N5Diet is where it’s at! Developed by nutritionists who are busy and needed a health strategy that wasn’t overly complicated and could fit into a busy lifestyle. 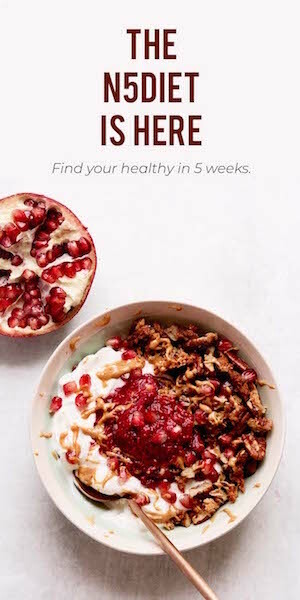 5 weeks, 5 simple steps and all recipes are cooked with 5 ingredients or less. Also, learn more about Baru Baron, by checking out our interview with them, and as always, if you whip up this recipe (or are insipired by it) don’t forget to use #naughtynutrition. 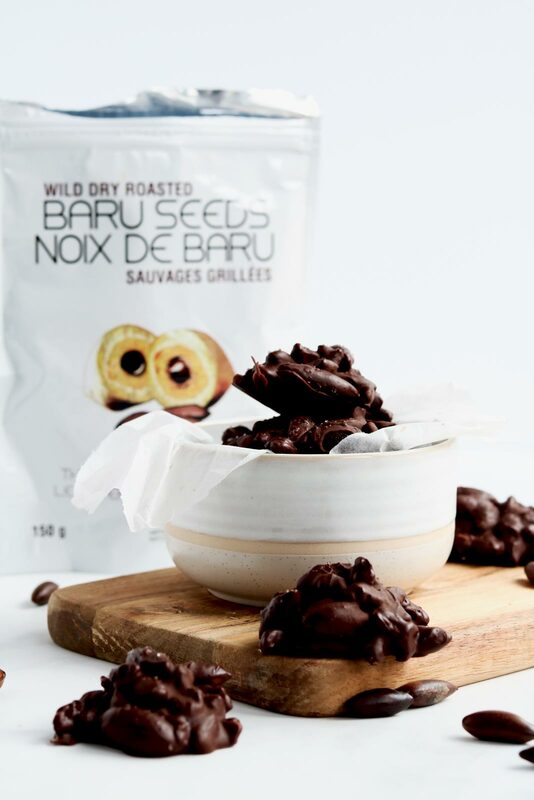 These 5 Ingredient Dark Chocolate Nut Clusters contain baru seeds, which is one of the worlds most nutrient dense seeds. Roast baru seeds at 350F for 5 minutes until dark. Melt chocolate in microwave on 30 second intervals, until fully melted. Add baru, walnuts and cinnamon to chocolate and combine. Take a spoon and spoon out clusters onto parchment lined sheet, sprinkle with salt, and freeze 2 hours. I’ve never heard of baru seeds before, I am intrigued! So simple, but delicious snack.. I can just imagine how good those nut clusters must be. Yes, they are a great little legume that tastes kind of like a cross between a peanut and a pumpkin seed. So yummy. The recipe can also be swapped with any other nut or seed you like. Yeah we hadn’t either until we ran into Baru Baron in a local farmer’s market. 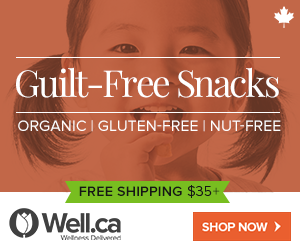 They have a very similar taste to peanuts and in nut clusters are just soooo good!